I ran into an interesting predicament the other day, and I thought that both the situation and my solution were worth sharing. Here's the scenario: I host websites for several family members and friends, and one of my family member's uses BlogEngine.NET for her blog. (As you may have seen in my previous blogs, I'm a big fan of BlogEngine.NET.) In any event, she forgot her password, so I logged into the admin section of her website, only to discover that there was no way for me to reset her password – I could only reset my password. Since it's my webserver, I have access to the physical files, so I decided to write a simple utility that can create the requisite SHA256/BASE64 password hashes that BlogEngine.NET uses, and then I can manually update the Users.xml file with new password hashes as I create them. // ...if not, reply with generic help message. // Retrieve a sequence of bytes for the password argument. // Retrieve a SHA256 object. // Convert the hashed password to a Base64 string. // Display the password and it's hash. That code snippet should be pretty self-explanatory; the application takes a single argument, which is the password to hash. Once you enter a password and hit enter, the password and it's respective hash will be displayed. C:\>BlogEnginePasswordHash.exe "This is my password"
That's all there is to do. Pretty simple stuff. // Verify the correct number of command-line arguments. // Show the help message if an incorrect number of arguments was specified. // Verify that the specified file exists. // Show the help message if a non-existent filename was specified. // Create a fileStream for the file. // Be sure it's positioned to the beginning of the stream. // Use the specified hash algorithm. // Compute the MD5 hash of the fileStream. // Compute the SHA1 hash of the fileStream. // Compute the SHA256 hash of the fileStream. // Compute the SHA384 hash of the fileStream. // Compute the SHA512 hash of the fileStream. // Compute the BASE64 hash of the fileStream. // Display the help message if an unrecognized hash algorithm was specified. // Write the hash value to the Console. // Display the help message. // Print the hash data in a readable format. Click Project, and then click the menu item your project's properties. In Windows Explorer, open your "C:\Windows\assembly" path, where C: is your operating system drive. Right-click the assembly, and then click Properties. Copy the Public Key Token value; for example: 426f62526f636b73. Over time I have changed the custom post-build event that I use when I am creating custom FTP providers, and my changes make it easier to register custom FTP providers. With that in mind, I thought that my changes would make a good blog subject. First of all, if you take a look at my How to Use Managed Code (C#) to Create a Simple FTP Authentication Provider walkthrough, you will see that I include instructions like my earlier examples to create a custom post-build event and retrieve the assembly information for your extensibility provider. The Microsoft FTP Service service is stopping.. The Microsoft FTP Service service was stopped successfully. The Microsoft FTP Service service is starting. The Microsoft FTP Service service was started successfully. Once you have that information, you simply need to reformat it as "FtpTestProvider, FtpTestProvider, Version=1.0.0.0, Culture=neutral, PublicKeyToken=eb763c2ec0efff75" in order to enter it into the FTP Custom Authentication Providers dialog box in the IIS Manager, or by following the steps in my FTP Walkthroughs or my Adding Custom FTP Providers with the IIS Configuration Editor blogs. He was using Visual Basic, and his code looked okay to me, so for the moment I was stumped. The FTP runtime state is exposed through a COM interface, and that is implemented in a DLL that is named "ftpconfigext.dll". That file should be registered when you install IIS, and I re-registered it on my system just for good measure, but that didn't resolve the issue. I had a brief conversation with one of my coworkers, Eok Kim, about the error that I was seeing. He also suggested re-registering the DLL, but something else that he said about searching the registry for the InprocServer32 entry made me wonder if the whole problem was related to the bitness of my application. To make a long story short - that was the whole problem. In today's blog I'd like to discuss some of the extensibility features that we added in FTP 8.0, and show you how you can use those in your FTP providers. In FTP 7.5 we provided interfaces for IFtpAuthenticationProvider and IFtpRoleProvider, which respectively allowed developers to create FTP providers that performed user and role lookups. In FTP 8.0 we added a logical extension to that API set with IFtpAuthorizationProvider interface, which allows developers to create FTP providers that perform authorization tasks. The title pretty much says it all: the provider that I describe in that walkthrough will walk you through the steps that are required to create an FTP provider that provides custom user authentication, verification of role memberships, and authorization lookups on a per-path basis. In FTP 7.5 if you wanted your provider to respond to specific user activity, the best way to do so was to implement the IFtpLogProvider.Log() interface and use that to provide a form of pseudo-event handling. In FTP 8.0 we add two event handling interfaces, IFtpPreprocessProvider and IFtpPostprocessProvider, which respectively allow developers to write providers that implement functionality before or after events have occurred. Once again, the title says it all: the provider that I describe in that walkthrough will walk you through the steps that are required to create an FTP provider that prevents FTP clients from downloading more files per-session than you have allowed in your configuration settings. Unfortunately there wasn't a code sample for that method; but as luck would have it, I had already written some code to do just that. (I love synchronicity...) With that in mind, I though that I'd post the code in a blog. In keeping with the cross-language samples that I wrote for the topics in the Configuration Reference, I thought that's I'd include several languages in this blog to make it easier for someone else to copy and paste. // Retrieve the sites collection. // Locate a specific site. // Create an object for the ftpServer element. // Create an instance of the FlushLog method. // Execute the method to flush the logs for the FTP site. // Locate and return the index for a specific element in a collection.
' Retrieve the sites collection.
' Locate a specific site.
' Create an object for the ftpServer element.
' Create an instance of the FlushLog method.
' Execute the method to flush the logs for the FTP site.
' Locate and return the index for a specific element in a collection. // Create a Writable Admin Manager object. // Retrieve the site element.
' Create a Writable Admin Manager object.
' Retrieve the site element. Hopefully this gives you an idea of how to call the FlushLog method. You can also use these examples to call the Start and Stop methods for FTP sites; you just need to substitute the correct method in place of the FlushLog method. I recently had an interesting scenario that was presented to me by a customer: they had a business requirement where they needed to give the same username and password to a group of people, but they didn't want any two people to be able to see anyone else's files. This seemed like an unusual business requirement to me; the whole point of keeping users separate is one of the reasons why we added user isolation to the FTP service. With that in mind, my first suggestion was - of course - to rethink their business requirement, assign different usernames and passwords to everyone, and use FTP user isolation. But that wasn't going to work for them; their business requirement for giving out the same username and password could not be avoided. So I said that I would get back to them, and I spent the next few days experimenting with a few ideas. One of my early ideas that seemed somewhat promising was to write a custom home directory provider that dynamically created unique home directories that were based on the session IDs for the individual FTP sessions, and the provider would use those directories to isolate the users. That seemed like a good idea, but when I analyzed the results I quickly saw that it wasn't going to work; as each user logged in, they would get a new session ID, and they wouldn't see their files from their last session. On top of that, the FTP server would rapidly start to collect a large number of session-based directories, with no garbage collection. So it was back to the drawing board for me. After some discussions with the customer, we reasoned that the best suggestion for their particular environment was to leverage some of the code that I had written for my session-based home directory provider in order to create home directory provider that dynamically created home directories that are based on the remote IP of the FTP client. If multiple FTP clients are accessing your FTP server through the same firewall, their remote IP might appear to be the same. If an FTP client is moving between geographic locations, such as traveling with a laptop, then the remote IP address will change, and the client will not see their files from their previous session. That being said, the customer felt that those limitations were acceptable for their environment, so I created a home directory provider that dynamically created home directories that were based on the remote IP address of their FTP clients. I agree that it's not a perfect solution, but their business requirement made this scenario considerably difficult to work around. Note: I wrote and tested the steps in this blog using both Visual Studio 2010 and Visual Studio 2008; if you use an different version of Visual Studio, some of the version-specific steps may need to be changed. Where "%SystemDrive%\inetpub\ftproot" is the home directory for your FTP site. Note: This last step is necessary for the custom home directory provider to create the isolation directories. In this step, you will create a project in Microsoft Visual Studio for the demo provider. Open Visual Studio 2008 or Visual Studio 2010. Type FtpRemoteIPHomeDirectory as the name of the project. Click Project, and then click FtpRemoteIPHomeDirectory Properties. Click the Reference Paths tab. Enter the path to the FTP extensibility assembly for your version of Windows, where C: is your operating system drive. Enter FtpRemoteIPHomeDirectoryKey for the key file name. If desired, enter a password for the key file; otherwise, clear the Protect my key file with a password check box. Choose .NET Framework 3.5 in the Target framework drop-down menu. Save, close, and re-open the project. Note: You need to be logged in as an administrator in order to restart the FTP service and add the dll to the Global Assembly Cache. 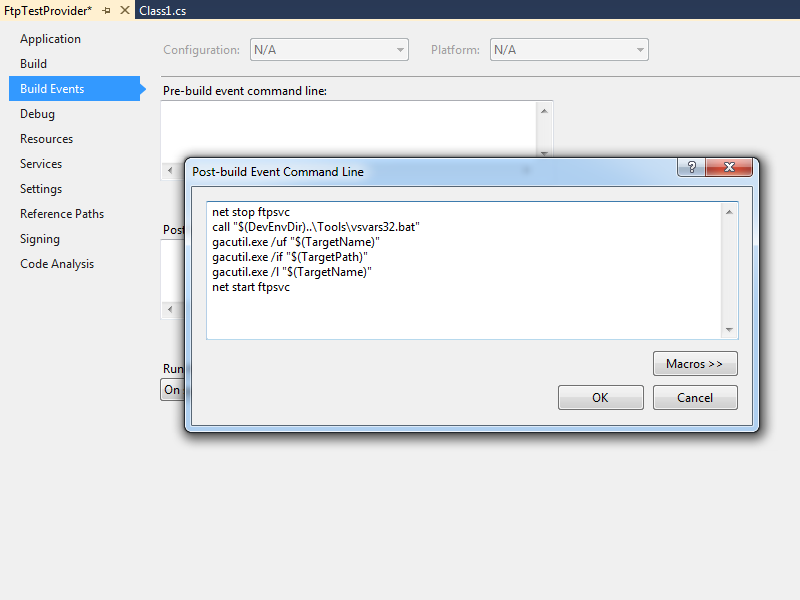 In this step, you will implement the extensibility interfaces for the demo provider. On the .NET tab, click Microsoft.Web.FtpServer. In Solution Explorer, double-click the Class1.cs file. // session IDs and remote IP addresses. // Store the path to the default FTP folder. // Override the default initialization method. // Test if the session dictionary has been created. // Create the session dictionary. // Retrieve the default directory path from configuration. // Test for the default home directory (Required). // Define the home directory provider method. // Create a string with the folder name. // Test if the folder already exists. // order to create each remote IP's home directory. // Return the path to the session folder. // Define the log provider method. // Test if the USER command was entered. // Reformat the remote IP address. // Add the remote IP address to the session dictionary. // Test if the command channel was closed (end of session). // Remove the closed session from the dictionary. In this step, you will add your provider to the global list of custom providers for your FTP service, configure your provider's settings, and enable your provider for an FTP site. Click your computer name in the Connections pane. Double-click FTP Authentication in the main window. Click Custom Providers... in the Actions pane. Enter FtpRemoteIPHomeDirectory for the provider Name. Clear the FtpRemoteIPHomeDirectory check box in the providers list. Note: The highlighted area contains the value that you need to update with the root directory of your FTP site. Note: The highlighted areas contain the name of the FTP site where you want to enable the custom home directory provider. Create a project in Visual Studio 2010 or Visual Studio 2008 for a custom FTP home directory provider. Implement the extensibility interface for custom FTP home directories. Add a custom home directory provider to your FTP service. When users connect to your FTP site, the FTP service will create a directory that is based on their remote IP address, and it will drop their session in the corresponding folder for their remote IP address. They will not be able to change to the root directory, or a directory for a different remote IP address. For example, if the root directory for your FTP site is "C:\Inetpub\ftproot" and a client connects to your FTP site from 192.168.0.100, the FTP home directory provider will create a folder that is named "C:\Inetpub\ftproot\192-168-0-100", and the FTP client's sessions will be isolated in that directory; the FTP client will not be able to change directory to "C:\Inetpub\ftproot" or the home directory for another remote IP. Once again, there are limitations to this approach, and I agree that it's not a perfect solution in all scenarios; but this provider works as expected when you have to use the same username and password for all of your FTP clients, and you know that your FTP clients will use unique remote IP addresses. I recently spoke with a great customer in India, and he was experimenting with the code from my Sending WebDAV Requests in .NET blog post. He had a need to send the WebDAV LOCK/UNLOCK commands, so I wrote a quick addition to the code in my original blog post to send those commands, and I thought that I'd share that code in an updated blog post. The updated code sample in this blog post shows how to send most of the common WebDAV requests using C# and common .NET libraries. In addition to adding the LOCK/UNLOCK commands to this version, I also changed the sample files to upload/download Classic ASP pages instead of text files; I did this so you can see that the WebDAV requests are correctly accessing the source code of the ASP pages instead of the translated output. This section of the sample writes a string as a text file to the destination server as "foobar1.asp". Sending a raw string is only one way of writing data to the server, in a more common scenario you would probably open a file using a steam object and write it to the destination. One thing to note in this section of the sample is the addition of the "Overwrite" header, which specifies that the destination file can be overwritten. This section of the sample sends a WebDAV request to lock the "foobar1.asp" before downloading it with a GET request. This section of the sample sends a WebDAV-specific form of the HTTP GET method to retrieve the source code for the destination URL. This is accomplished by sending the "Translate: F" header and value, which instructs IIS to send the source code instead of the processed URL. In this specific sample I am using Classic ASP, but if the requests were for ASP.NET or PHP files you would also need to specify the "Translate: F" header/value pair. This section of the sample sends an updated version of the "foobar1.asp" script to the server, which overwrites the original file. The purpose of this PUT command is to simulate creating a WebDAV client that can update files on the server. This section of the sample retrieves the updated version of the "foobar1.asp" script from the server, just to show that the updated version was saved successfully. This section of the sample uses the lock token from the earlier LOCK request to unlock the "foobar1.asp"
This section of the sample copies the file from "foobar1.asp" to "foobar2.asp", and uses the "Overwrite" header to specify that the destination file can be overwritten. One thing to note in this section of the sample is the addition of the "Destination" header, which obviously specifies the destination URL. The value for this header can be a relative path or an FQDN, but it may not be an FQDN to a different server. This section of the sample moves the file from "foobar2.asp" to "foobar1.asp", thereby replacing the original uploaded file. As with the previous two sections of the sample, this section of the sample uses the "Overwrite" and "Destination" headers. This section of the sample deletes the original file, thereby removing the sample file from the destination server. This section of the sample creates a folder named "foobar3" on the destination server; as far as WebDAV on IIS is concerned, the MKCOL method is a lot like the old DOS MKDIR command. This section of the sample deletes the folder from the destination server. // Some sample code to put in an ASP file. // Some XML to put in a lock request. // Define username, password, and lock token strings. // Create an HTTP request for the URL. // Set up new credentials. // Define the HTTP method. // Specify that overwriting the destination is allowed. // Specify the content length. // Optional, but allows for larger files. // Retrieve the request stream. // Write the string to the destination as text bytes. // Close the request stream. // Write the response status to the console. // Specify the request timeout. // Specify the request content type. // Write the lock XML to the destination. // Retrieve the lock token for the request. // Specify the request for source code. // Retrieve the response stream. // Create a stream reader for the response. // Close the response streams. // Specify the lock token. // Write the string to the destination as a text file. // Specify the destination URL. Since the code sample cleans up after itself, you should not see any files or folders on the destination server when it has completed executing. To see the files and folders that are actually created and deleted on the destination server, you would need to step through the code in a debugger. This updated version does not include examples of the WebDAV PROPPATCH/PROPFIND methods in this sample for the same reason that I did not do so in my previous blog - those commands require processing the XML responses, and that is outside the scope of what I wanted to do with this sample. I had a question from someone that had an interesting scenario: they had a series of reports that their manufacturing company generates on a daily basis, and they wanted to automate uploading those files over FTP from their factory to their headquarters. Their existing automation created report files with names like Widgets.log, Sprockets.log, Gadgets.log, etc. But they had an additional request: they wanted the reports dropped into folders based on the day of the week. People in their headquarters could retrieve the reports from a share on their headquarters network where the FTP server would drop the files, and anyone could look at data from anytime within the past seven days. This would have worked great for most scenarios, but they pointed out a few problems in their specific environment: manufacturing and headquarters were in different geographical regions of the world, therefore in different time zones, and they wanted the day of the week to be based on the day of the week where their headquarters was located. They also wanted to make sure that if anyone logged in over FTP, they would only see the reports for the current day, and they didn't want to take a chance that something might go wrong with the batch file and they might overwrite the logs from the wrong day. With all of those requirements in mind, this was beginning to look like a problem for a custom home directory provider to tackle. Fortunately, this was a really easy home directory provider to write, and I thought that it might make a good blog. You need to create the folders for the days of the week under your FTP root directory; for example, Sunday, Monday, Tuesday, etc. Type FtpDayOfWeekHomeDirectory as the name of the project. Click Project, and then click FtpDayOfWeekHomeDirectory Properties. Enter FtpDayOfWeekHomeDirectoryKey for the key file name. // Return the path to the folder for the day of the week. Enter FtpDayOfWeekHomeDirectory for the provider Name. Clear the FtpDayOfWeekHomeDirectory check box in the providers list. When users connect to your FTP site, the FTP service will drop their session in the corresponding folder for the day of the week under the home directory for your FTP site, and they will not be able to change to the root directory or a directory for a different day of the week. Over the past few years I've created a series of authentication providers for the FTP 7.5 service that ships with Windows Server 2008 R2 and Windows 7, and is available for download for Windows Server 2008. Some of these authentication providers are available on the http://learn.iis.net/page.aspx/590/developing-for-ftp-75/ website, while others have been in my blog posts. With that in mind, I had a question a little while ago about using an LDAP server to authenticate users for the FTP service, and it seemed like that would make a great subject for another custom FTP authentication provider blog post. The steps in this blog will lead you through the steps to use managed code to create an FTP authentication provider that uses a server running Active Directory Lightweight Directory Services (AD LDS) that is located on your local network. You must have an AD LDS server available on your local network. Note: See my How to Set Up an Active Directory Lightweight Directory Services (AD LDS) Server blog post for more information. I tested this blog by using the user objects from both the MS-User.LDF and MS-InetOrgPerson.LDF Lightweight Directory interchange Format (LDIF) files. In this step, you will create a project in Visual Studio 2008 for the demo provider. Type FtpLdapAuthentication as the name of the project. Click Project, and then click FtpLdapAuthentication Properties. Enter FtpLdapAuthenticationKey for the key file name. Note: You need to be logged in as an administrator in order to restart the service and add the dll to the Global Assembly Cache. In this step, you will implement the authentication and role extensibility interfaces for the demo provider. // Retrieve the provider settings from configuration. // Test for the LDAP server name (Required). // Attempt to look up the user and password. // Attempt to look up the user and role. // Create the context object using the LDAP connection information. // Test for LDAP credentials. // If LDAP credentials do not exist, attempt to create an unauthenticated directory entry object. // If LDAP credentials exist, attempt to create an authenticated directory entry object. // Create a DirectorySearcher object from the cached DirectoryEntry object. // Specify the the directory searcher to filter by the user name. // Specify the search scope. // Specify the directory properties to load. // Specify the search timeout. // Retrieve a single search result. // Test if no result was found. // Return false if no matching user was found. // Attempt to validate credentials using the username and password. // Throw an exception if an error occurs. // Retrieve the distinguishedName for the user account. // Specify the the directory searcher to filter by the group/role name. // Loop through the member collection. // Test if the current member contains the user's distinguished name. // Return true (role lookup succeeded) if the user is found. // Return false (role lookup failed) if the user is not found for the role. In this step, you will add your provider to the list of providers for your FTP service, configure your provider for your LDAP server, and enable your provider to authenticate users for an FTP site. Enter FtpLdapAuthentication for the provider Name. Clear the FtpLdapAuthentication check box in the providers list. Server Name and TCP/IP Port: This is the name (or IP address) of the server that is hosting your LDAP service; the port is usually 389. These will be added to your provider using the "SERVERNAME:PORT" syntax. LDAP Partition: This is the LDAP path within your LDAP service to your data, for example: "CN=ServerName,DC=DomainName,DC=DomainExtension." LDAP Username: This is a username that has access to your LDAP server; this is not the name of an account that you will use for FTP access, and it does not have to be a Windows account. LDAP Password: This is the password that is associated with the LDAP username. Note: The highlighted areas are the values for the ldapServer, ldapPartition, ldapAdminUsername, and ldapAdminPassword settings, which configure your network environment for your LDAP server. Open an FTP site in the Internet Information Services (IIS) Manager. Check FtpLdapAuthentication in the providers list. Double-click FTP Authorization Rules in the main window. Click Add Allow Rule... in the Actions pane. Select Specified users for the access option. Enter a user name that you created in your AD LDS partition. Select Specified roles or user groups for the access option. Enter the role or group name that you created in your AD LDS partition. Select Read and/or Write for the Permissions option. 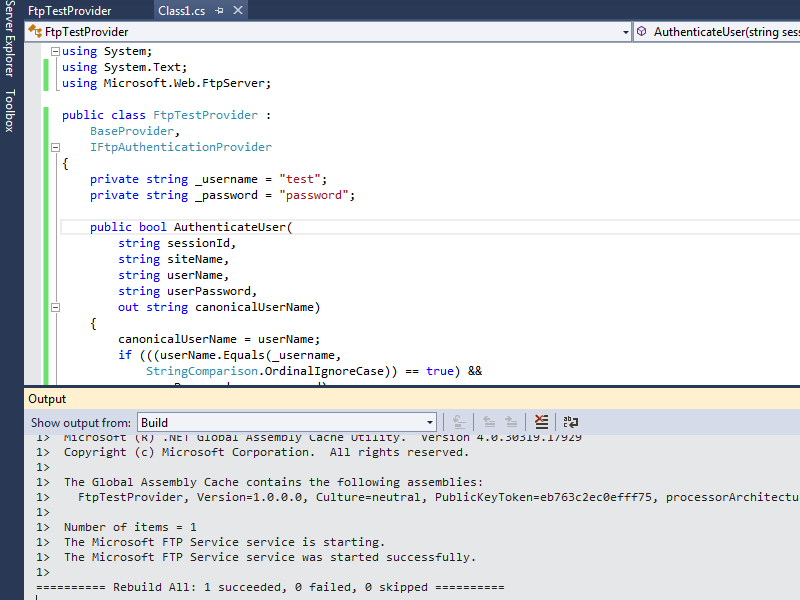 Create a project in Visual Studio 2010 or Visual Studio 2008 for a custom FTP authentication provider. 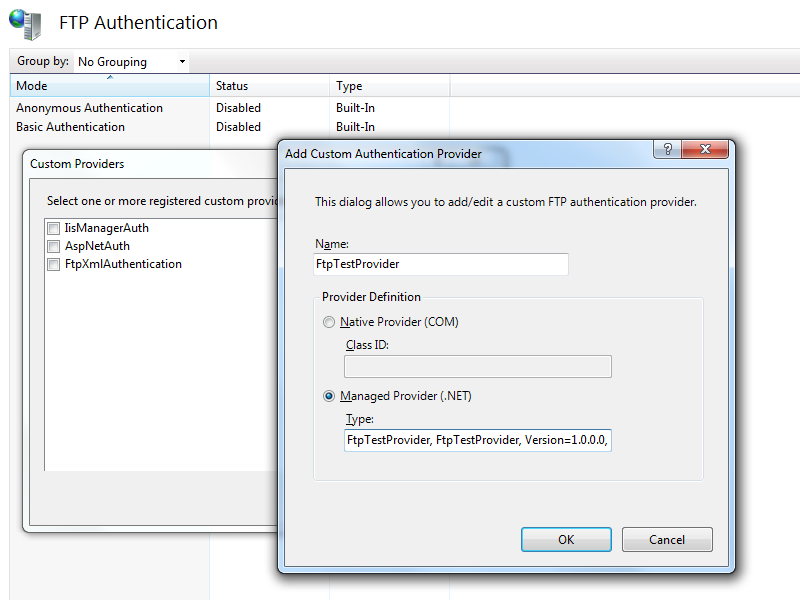 Implement the extensibility interface for custom FTP authentication. Add a custom authentication provider to your FTP service. When users connect to your FTP site, the FTP service will attempt to authenticate users from your LDAP server by using your custom authentication provider. The PrincipalContext.ValidateCredentials() method will validate the user name in the userName parameter with the value of the userPrincipalName attribute of the user object in AD LDS. Because of this, the userPrincipalName attribute for a user object is expected to match the name of the user account that an FTP client will use to log in, which will should be the same value as the cn attribute for the user object. Therefore, when you create a user object in AD LDS, you will need to set the corresponding userPrincipalName attribute for the user object. In addition, when you create a user object in AD LDS, the msDS-UserAccountDisabled attribute is set to TRUE by default, so you will need to change the value of that attribute to FALSE before you attempt to log in. For more information, see my follow-up blog that is titled FTP and LDAP - Part 2: How to Set Up an Active Directory Lightweight Directory Services (AD LDS) Server.